His name is Azzari, Persian for Fire. And full of fire he is! 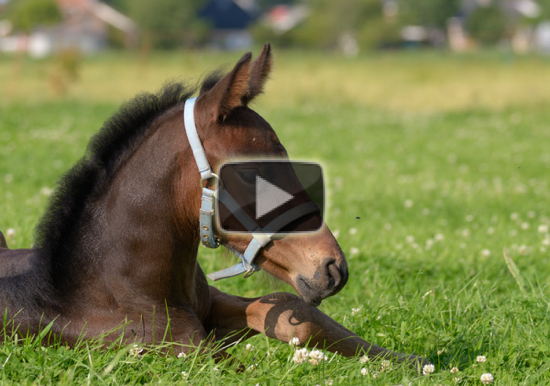 This series is about my adventures with my foal Azzari. I decided to share my experiences, because there are a lot of things that CAN happen, SHOULD happen, and WILL happen, and of course there are also things that SHOULD NOT happen at all (being mostly things WE shouldn’t do)! Basically, raising a foal will determine how it will be in the future. How it will interact with it’s surroundings is “programmed” in those early years. So, it is important to make decisions at “the first try” ! A foal is one of the sweetest and cutest things I have ever experienced, and the responsibility is enormous. But, in essence, when a horse is born, it is also a WILD animal. I figured my goal would have to be to socialize him to humans, but at the same time to retain his wildness as much as possible. That would be my guide line. And when searching for info and advice, here too, I got all kinds of conflicting advice, (often without a thorough explanation). Even later, when Azzari was about 10 months already, in the discussion groups about K.F. Hempfling, I found conflicting advice. Some even insist very strongly on letting the foal live in the “wild” until 3 years without any human interaction at all, otherwise the spirit of a horse would be broken!… I even heard that not heeding to this advice would be a capital sin towards the horse. So, once again, I gathered all the advice, started reading books and internet pages, discussing in formus etc etc. and made my own choices, based upon my heart, and what I thought would be best for him. A thought remained with me, that letting a horse alone for the first 3 years, leading him to believe he is free, whilst his future would be not so, would seem equally unfair. The trauma from being caught and separated from his herd, and the sudden discovery that he’d be trapped from then on, would break his spirit too. Of course there is more than one way to raise a foal, so I don’t claim to have the ultimate solution. And each horse is a unique personality too! Whilst writing this, Azzari is still 18 months young, so at this moment I have no guarantee it will come out right! I have only faith, friendship and determination. We decided for “being there” with Azzari because I felt that, because humans would always be in his life, it would be a good thing that he’d get used to us right away. And find out right from the start, that we were always there for him, and never a threat. All went pretty smooth actually. Most important was to have the horses get their exercise and that the young one gets enough milk. Especially the first milk is full of antibodies and helps the foal though the first month or so. So we monitored all that carefully. We kept the stables as clean as possible, and enjoyed all what we experienced. Avanti, the mother, made all kinds of new soft and tender sounds and gestures to her little boy. She was a great and caring mother. We kept Azzari and his mother separated from the other horses. We made sure a special pasture not far from the others was safe, and that the new foal could not get into trouble. We also introduced the halter and leading rope to Azzari for the simple practical reason that we had to lead them to the pasture over a small road.. Avanti trusted us, she was a great mother, and a great help, she found it to be totally okay that we were haltering her son. We let them walk side by side at first, a human leading each one individually on a lead rope. It all went easy. We already had some experience with body language and used that when leading. Start, stop turning, that was all, and we only used this to bring them in and out of the pasture/stable. One thing we observed was that a foal reacts totally instantly to body language, and even directly to a thought in our heads. They know all already! For me that was an important observation, because, despite mixed experiences, I have always believed in “thoughts-communication” (telepathy). And here was an individual that reacted instantly to thoughts/images that would fit into the mind of a horse! Being with Azzari at that time had taken away any doubts I still had on that subject. And from that moment on I have always supported my requests (to ANY horse) with an appropriate thought / image. After a few weeks both had gotten used to each other, Azzari was already growing, and we thought it was time to introduce them to the other horses in the herd. All went well, and we’d never thought that Avanti would be that protective to the other horses, since she had been so incredibly easy with us. And here she was keeping all others at a safe distance! WOW! I never figured she head it in her! But eventually the others were allowed to come closer, and routine settled in. After a while the stayed outside permanently 24/7. From here we started picking up his legs, scratching and grooming him, and even doing some (very) minor leading exercises (slack rope, for very short periods). We monitored Avanti and the mood of Azzari to determine how far we’d go, but they found it all no problem at all. After a few months (Azzari was about 4 months) my nephew’s wife kindly inquired how we were going to do the weaning, (she owns a huge professional breeding and riding facility) and when I explained we were going to do it softly and gradually, she raised her eyebrows and looked at me with utter disgust, and replied: “How could you ever think of doing that? You should separate the foal totally and permanently at the age of 4 months. And never ever let him drink again!” You’d be cruel to do otherwise!!! Oops, it seemed I’d be going against a professional’s opinion once more! And then there was the matter of “tying” him down. Many people, including the stable master insisted we do this: The “exercise” would make him learn to stand still. The idea would be to tie him to a solid post, and let him resist, and pull and pull until he gave up… My first thought: My God, are we barbarians or what? How about I just ask him to do so? (using body language and showing an “image” of a horse standing still…). I remember the first time I did this, I could let him stand PERFECTLY still for 20 seconds. We repeated this daily, and we could lengthen the period more and more. So eventually we could tie him to a post, and he already understood! So there was NO resisting or pulling at all!! At about 6 months he had hurt his hind legs through a crazy jump he tried, and we had much benefit from handling his legs and letting him stand still in full confidence, so we could treat his bleeding scratches without getting kicked… The vet was most pleasantly surprised he found such a cooperative young colt! And from about 8-10 months we started to separate them for very short periods. That was practical, because that way we were able to move them without stress, to other fields by one person. I also wished to start taking up the walks I did with Avanti in the future. We started this by leading each horse in the opposite direction in the SAME field, and then releasing them. That was the first step. We found out that the “magnetic bond” between mother and son became less and less “demanding” as we progressed. Gradually the need to run back to each other declined slowly and gradually. Same procedure at placing them into adjacent pastures, and then, as winter came, leading them to and from the stable one by one, for the night (at that time we kept them together in one large (8x4mtrs) stable for the night), so gradually, we were “automatically” gliding into the beginning of the weaning process. We started the weaning because we noticed that the combination of both resulted into more and more emotional pressure. Avanti became more and more unsettled and irritated when Azzari wanted to drink. And Azzari became more and more “demanding” and bossy to his mother. I suspect she was even bitten by him sometimes. She also wanted to rest at moments Azzari wanted to jump and play. Besides Azzari was already eating grass and hay too, in a speed we became concerned about the mother’s food intake. Here a video of First days of Avanti and Azzari outside. The period from year one to two. The yearling period. And again people said we were in for a rough and tough ride. Or not? Do you agree with Paul's approach?